We are so quick to complain and slow to praise – But sometimes we get customer service above and beyond the job description which warrants a broader mention thank just a thank you face to face. 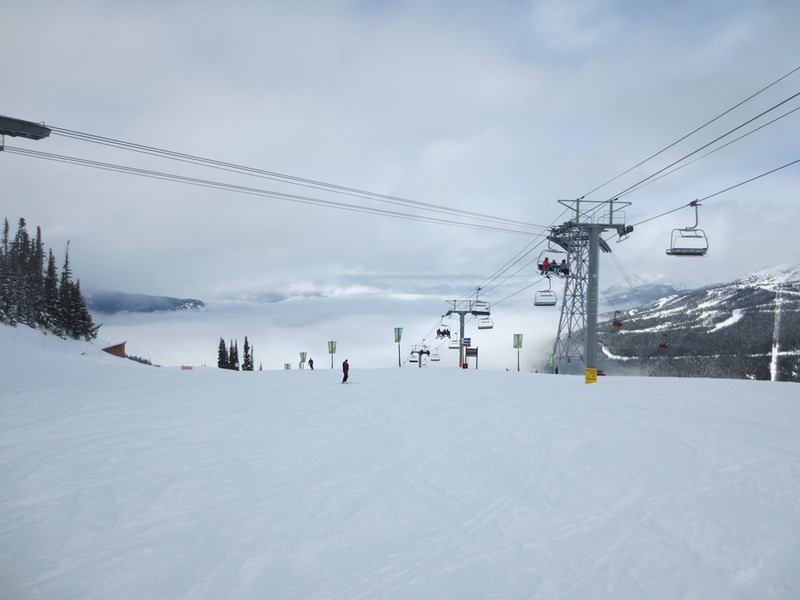 I want skiing in Whistler, B.C. Canada earlier this month. I love everything about Whistler, the mountains and slopes, the après ski, the location, the hotels, restaurants, spas and bars. it is my ideal ski resort. This year I returned to the Crystal Lodge. I like this place — it’s close to the ski hire place, close to the lifts and on the main village stroll. I don’t like to trek around too much in my ski boots. 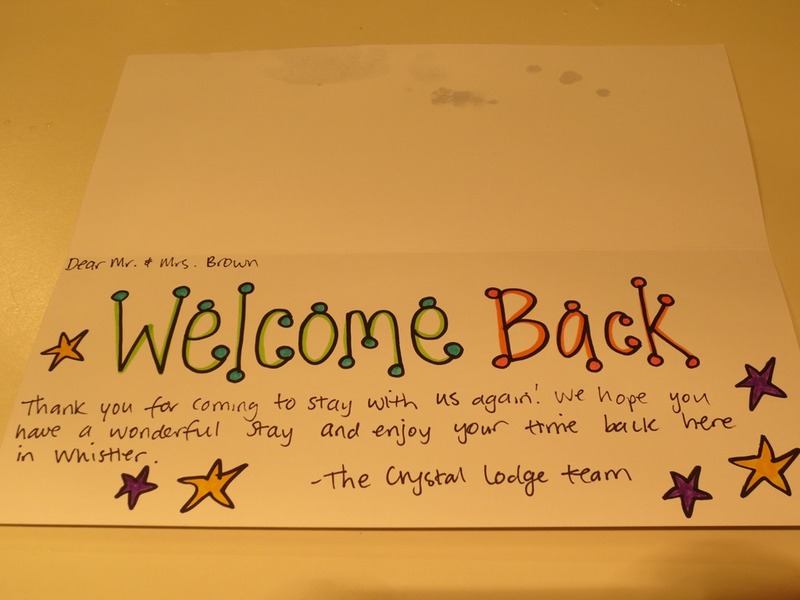 I was welcomed back to the hotel when I checked in — there was a Welcome Back card in my room when I arrived. A nice touch from the staff. I collected my skis and went to find somewhere to eat. The snow was amazing the next morning. There was about 9” of snow overnight and everything looked lovely. I wanted to ski a couple of easy runs to get into the swing of skiing. I stopped to take this picture and skied down the start of this slope – an easy run on my first morning there. I turned, hit a churned up patch of snow. I fell – slowly and twisted my knee. My skis didn’t come off and I pulled all of the ligaments (I found out later). Miserably I picked my way down to the nearest chair (in the image), went back to the room in the hotel and sat there feeling sorry for myself with ice packs on my knee trying to reduce the swelling. The Manager at the Crystal Lodge called to welcome me back and ask me if I’d had a good day. I told him of my injury and how miserable I was. An hour later there was a knock at the door – a delivery from the Manager for me. I was touched.What a great example of customer service. I was really impressed. Now I’m on the hotel’s files as an injured guest. When I checked out of the Lodge 6 days later, staff reception enquired how my knee was doing (I’d skied all week on the easy slopes as I did not want to waste such a lovely trip). My knee would have been better if I’d have rested it a bit more but (skiers) needs must! I flew home to the UK and noticed this tweet. This was the icing on the cake for customer service going the extra mile in my opinion. Although I only visit Whistler for a week each year – and have only stayed in the Crystal Lodge three times, the staff thought that my business was worth keeping. The hotel does not have an automated social media / customer relationship management system – nor were these cards printed out as they sometimes are in other hotels. Real people hand wrote the cards for the real people that stay at the hotel. 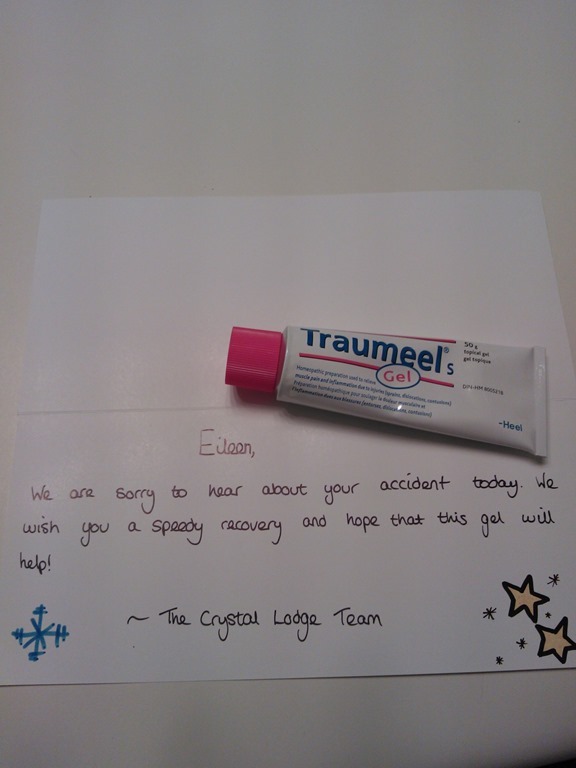 The staff at the hotel went the extra mile to show customer care to an infrequent guest. 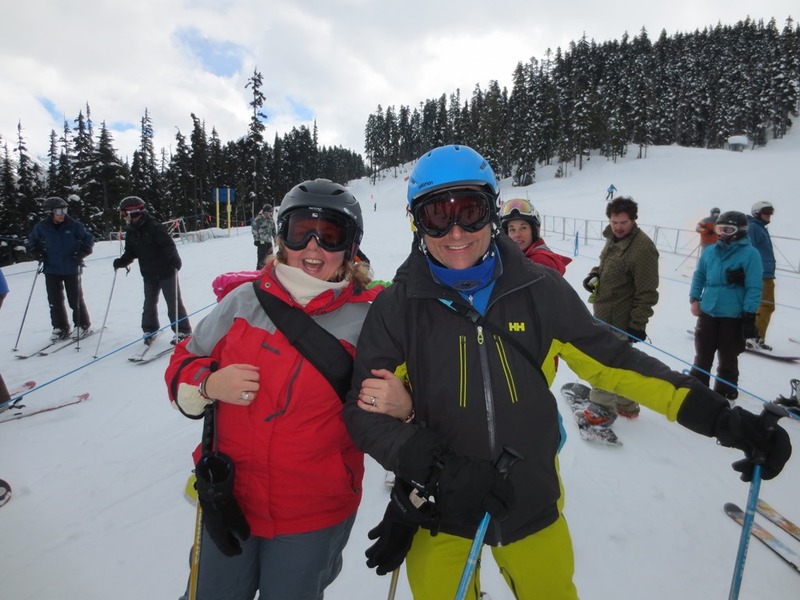 This entry was posted in Customer Engagement, Customer Relationships, Customer Service and tagged Customer Service, how to ski, ski injury, skiing, whistler on March 27, 2014 by eileenb. It is all very well liking pages on Facebook, sharing images and links about something you care about, but how many times does your action have a positive effect? Charity nominations and just giving pages sometimes get overlooked. The post or email gets read and left in your inbox for another free moment. Once we have liked the page, we move on to the next article. Struggling shops get our sympathy. Huge multinationals moving into our local area get our ire and anger at the destruction of the local economy. We retweet things on Twitter and share articles on Facebook. But what do you actually do about it? Cash mobs actually go beyond the passive idea of the Facebook Like. Cash mobs use actual hard cash, spent in a local shop. It is all done through the local community grouping together and using their combined networks to spread the word about the local shop that needs support. It is a little bit like crowdfunding only this generates real cash for bricks and mortar businesses in the local community. The community gets together and decides to spend £10 ($20) or less in a local shop on a designated day. The local shop gets business that would have otherwise gone to a multinational chain of shops and the local community is energised. News of the designated shop gets posted on social media. The information is broadcast amongst the community in the local parish magazine, village flyer and local social media. On the specific day, members of the community visit the store and buy something. Cash mob, Bremerton in Washington state, US has a Facebook page and advertises when and where the next cash mob will be. Cash mob at Queen Anne Heart advertises its cash mob target in chalk on the pavement. Chagrin Hardware in Ohio had so many customers when it was mobbed in 2012, the credit card machine had to be reset. The community flocked to Petosa’s Family Grocer in Edmonds, Washington after flood damage. It is a simple concept. Shop local, buy from local shops to keep the local economy alive. And the initiative has support from large multinational companies too. Throughout July, American Express is encouraging everyone to support local shops. It is running an initiative for July in encouraging you to ‘shop small’. Register your Amex card, and spend £10 or more at a local shop. Amex will give you £5 credit per location for up to ten different shops cafes and restaurants. That’s £50 in credits just for shopping locally. So why don’t you register, organise a Cash Mob in your area and help local businesses survive. After all, the independent shops, cafes and bars are the reason that you love living where you are. So put some of your money into local businesses, and keep your local community alive. This entry was posted in Community, Crowdsourcing, Customer Engagement, Customer Relationships, Social Commerce and tagged cash mob, local business, local economy on July 1, 2013 by eileenb. 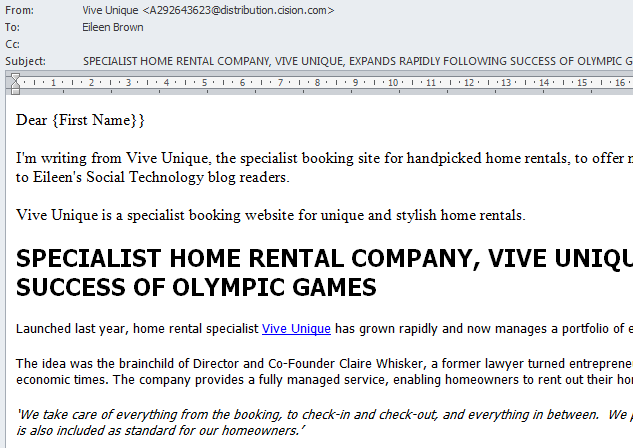 Do your email newsletters make your customers feel special? This one certainly does not. Have a look at these howling errors. Capital letters in the title. STOP SHOUTING AT ME! It never enchants customers. Irrelevant subject matter Vive Unique has no idea at all what my blog is about – Polly Western from Vive Unique should certainly do her research better. An instant turnoff – and not a credit to the brand at all. Testing takes minutes and can change customer perception about your brand. Unfortunately, for me, it will take a long time for me to consider this company in a positive light – no matter how good the product is. This email was probably sent out to thousands of potential customer from this PR agency, all of which would have had the same reaction to the depersonalised email. Delete, delete delete. What a waste of a potentially good campaign that could have brought in sales for the business. A little preparation, consideration and care before hitting that send button would have made all the difference between a sale or a delete. This entry was posted in Customer Engagement, Customer Relationships, Customer Service, Marketing and tagged best practices, email marketing, failure, Marketing, newsletter on October 16, 2012 by eileenb. I seem to get more and more unsolicited phone calls nowadays. In addition to the regular calls telling me I have a virus or malware on my PC, I’m getting more and more calls I don’t want. I’m bored with just putting the phone down on the callers. I want to tie up their lines so that they don’t get the chance to call others and annoy them. They call from PC support. I say yes, I’ve been waiting for an engineer to arrive. When are you going to get here? They call from a Microsoft Partner to say I have a virus. I tell them they have got through to the reception of a large company and ask them which department they want to be connected to. Yet another call. These guys don’t give up do they? This time I start talking about the Workstation and Server service which appear not to be working on this machine. Callers from a call centre, far far away.. I tell the caller that I’d love to have new white UPVC windows / conservatory / porch, but I’m not sure how it works with a grade I listed building /court judgement / bankruptcy notices etc. I was asked whether I wanted a cheap family portrait done. I said I was single with no family. He suggested that I had my photo taken with a pet. I told him I had no pets apart from 2 chickens and I didn’t particularly didn’t fancy having my photo taken with either of them. This entry was posted in Customer Engagement, Scam and tagged hints and tips, phone scam, Scam on April 24, 2012 by eileenb. Facebook Private messages: Good for social business, good for CRM? Now brands can use Facebook Direct messaging to respond privately to their customers for a more personalised support experience. 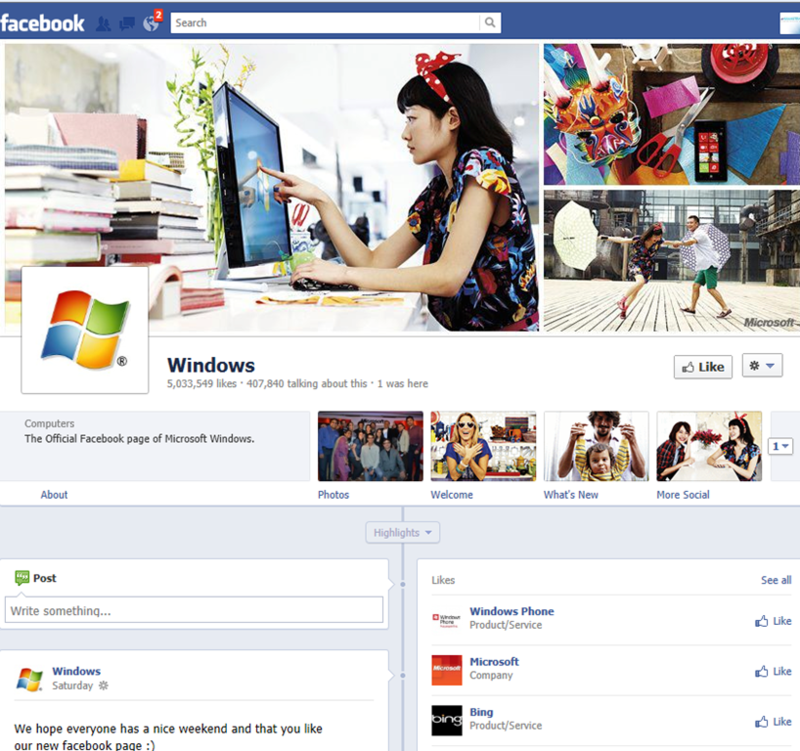 Facebook has rolled out its new version of Brand pages. These look like the page familiar to users who have enabled Timeline view. It will also include a feature to improve social CRM – if it gets it right..
Now, when customers interact with the brand, the brand has the opportunity to respond by private message, without the rest of the stream seeing the interaction. Brands can also respond to individual wall posts through private message, as long as a fan initiates the conversation. Private messages for pages will be great for brands that want to get open and honest feedback from their customers. Although it is currently only available in Asia, it will be rolled out world wide soon. Brands need to get their act in gear if they want to take advantage of the 1:1 interaction with their customers. They need to respond in a positive, and timely way to avoid any negative responses. Bob Kraut, SVP of advertising and marketing communications for Arby’s, suggested the direct messages may help firms avert comment threads that spiral out of control, causing bad branding. "This [will] lower the risk and be better for customers in the long run," he said. "There will be more people in the game, and maybe less transparency. But maybe the customer is fine with that. It’s the customer that counts." This entry was posted in Customer Engagement, Customer Relationships, Customer Service, Facebook, Social CRM and tagged Customer Relationships, Customer Service, Facebook, Facebook Pages, Social CRM on March 5, 2012 by eileenb. Aah – this is really sweet…Coca cola has some brilliant ideas to connect with its customers. This is the happiness machine which only dispense drinks if you can prove you’re a couple. What a great way to connect with people. And make folks feel really great about the brand… Kudos to Digital buzz for the find.. This entry was posted in Campaign, Customer Engagement, Customer Relationships, Marketing and tagged buzz, coca cola, Customer Relationships, happiness machine on March 1, 2012 by eileenb. … and 35% of users post information about a brand on social media sites. There’s a lot of engagement. But all this engagement is totally wasted if you don’t know what is being said about you. Do you care about what is happening online? 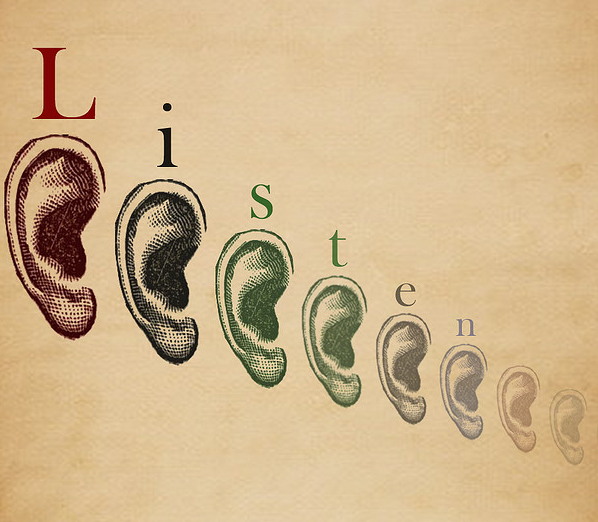 Do you have a listening strategy? No? well, you’re not alone. If you’re one of the 18% of brands that doesn’t have a brand monitoring strategy in place. What should you do? There are many more tools, with new tools evolving and disappearing each month so this list is not exhaustive. When brands listen actions happen. 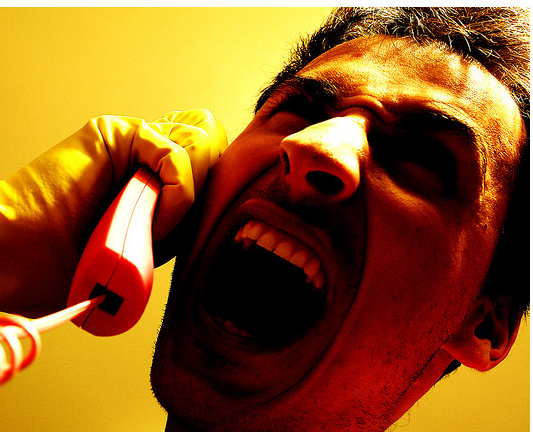 Brands shouldn’t wait until a social crisis occurs before they respond. They need to respond promptly and they need to listen to the customer. This entry was posted in Branding, Customer Engagement, Customer Relationships, Customer Service on January 12, 2012 by eileenb.